Thank you all for a wonderful semester. Here is a summary, in chronological order, of our recorded lectures. You can also view the entire playlist on youtube. Marti Hearst, the course instructor at UC Berkeley, introduces the main concepts for the course, and Gilad Mishne (@gilad) of Twitter describes his goals for the course and provides an introduction to Twitter. (slides for lecture1a) (slides for lecture1b). Othman Laraki (@othman), Twitter’s Vice President for Growth, International and Revenue, on Growing a Human-Scale Service, and Raffi Krikorian (@raffi), the Director of Twitter’s Platform Services group, on the Twitter Software Ecosystem. View the slides for Othman‘s and Raffi‘s talks. Bill Graham (@billgraham), who is active in the Hadoop community and a Pig contributor, gave a very clear and detailed intro to Hadoop and outlined how it is used at Twitter. His slides can be found here. 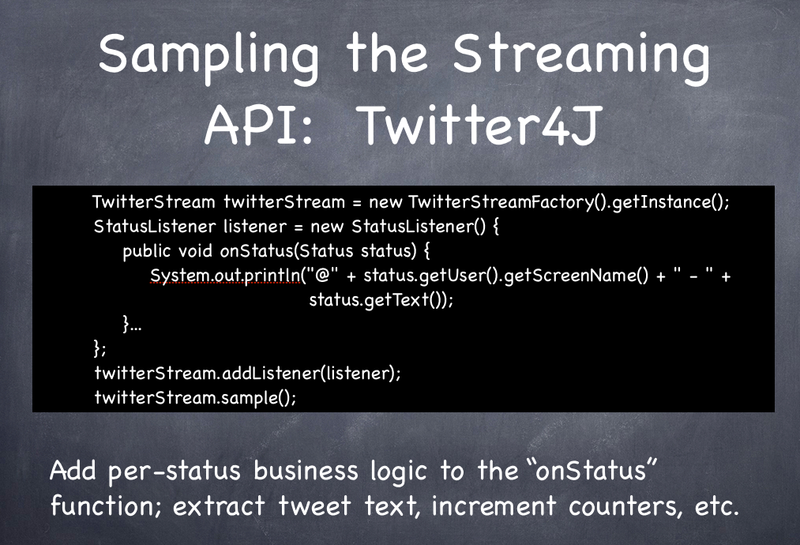 Rion Snow (@rion) gave an introduction to the Twitter API, including the RESTful API and the streaming API for both Java and Python. See all the slides (no video). If you’d like to know how Twitter computes its Trending Topics, Kostas Tsioutsiouliklis (@kostas) shared some of the secrets with the class. He also talked about MinHash algorithms. See his lecture notes. Brian Larson (@larsonite), the tech lead for search and relevance at Twitter, gives a detailed technical talk about how real-time search works at Twitter. Learn about weak ties, triadic closures, and personal pagerank, and how they all relate to the Twitter social graph from Aneesh Sharma (@aneeshs) in this lecture. Slides here. Joey Gonzalez, a recent PhD from CMU and a postdoc at UC Berkeley, is working on GraphLab, the hot technology for processing huge graphs quickly. There is new a version called GraphChi (for chihuahua) that you can run on your personal computer; so you don’t even need access to EC2 to run it going forward. Slides here. Kurt Thomas is a former Twitter engineer and a current PhD student at UC Berkeley who studies how the criminal underground conspires to make money via unintended uses of computer systems. He talked about fraud detection for Twitter and other online systems. See his lecture notes. Stan Nikolov (@snikolov) of the Twitter Search and Relevance team walked through one particular theoretical model of information diffusion which tries to predict under what conditions an idea stops spreading based on a network’s structure. The slides in his Lecture Notes let you see the Pig scripts in detail, and you can see the video simulatinos that Stan created on his blog. On Thursday we learned about an alternative language for analyzing big data: Scalding. It’s built on Scala and is used extensively by the Twitter Revenue group. Oscar Boykin (@posco) presented a lecture that he and Argyris Zymnis (@argyris) put together. See the lecture notes for more details. These lecture notes simply summarized the course at a high level. Thanks for the great semester!